Your Smartphone as a Path to Well-being? Julie Fischer McCarter, Julie is a fine art photographer and therapist, blending the art of expressive photography and emotional wellness. 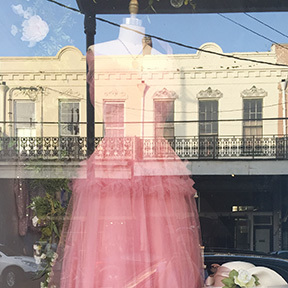 © Julie McCarter / Image captured with my iPhone, on a stroll through New Orleans. We all have a sense that creativity is good for the soul, and now research supports that there is a link between well-being, positive emotion and daily creativity. I’d like to offer a simple reminder that we all have easy access to a creative tool, thanks to our smartphone cameras. Instead of snapping selfies though, I’d like to encourage you to try going outside the box a bit with these creative photo assignments. You can get your creativity flowing in just a few minutes a day and do your own research on creativity and well-being. Photo Assignment #1 / Color: Pick a color to focus on for the day and just pay attention to where it appears throughout your day. Snap a series of photos of that color, see if you can tie the images you take all together in some way and maybe post a quick collage on social media with a creative hashtag. Photo Assignment #2 / Finding Hearts: As you move through your day, see if you can spot naturally occurring heart shapes. I’ve found heart rocks, heart shaped tears in napkins, chipped paint hearts…the list goes on. Snap and share the hearts you find or send one to someone you love. Photo Assignment #3: Light Walk: Take a walk and see if you can focus your attention on light and shadow. What captures your eye? Create a few images of the light coming through the trees, the shadow on your car or the even light on a cloudy day. Feeling inspired yet?